Three simple carabiners. 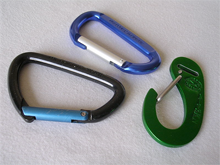 A carabiner is a metal loop device used in climbing, rescue, and other safety-critical situations. Usually, one passes a rope or harness piece through the loop to secure it to something capable of suspending the load, which is usually a person. To make it convenient to pass the rope through the metal loop, the carabiner has a "gate" that opens to enable the rope to enter the loop without having to thread the rope through the loop end-first. In the pictured carabiners, the gates are spring-loaded. That is, one pushes the rope against the gate from the outside, and after the gate swings open, and the rope passes it, the gate springs shut capturing the rope until one presses on the gate from the outside once more, opening it. After the rope is captured, only a rare kind of accidental event can unintentionally free it. So it is with deadlocks in teamwork. They form easily, but only a rare kind of accidental event can break the deadlock unintentionally. To intentionally break a deadlock that formed because of a dependency loop usually requires coordinated action and much intra-team communication. Teams enable us to do things we could never accomplish working individually — or if we could accomplish them, they would just take too long to be worth doing. For that reason alone, we need teams. But working in teams carries with it risks that arise much more often than when we work as individuals. Here's a short catalog of these risks. The power of teamwork amplifies not only the team's ability to do good, but also its ability to do damage. When we produce wrong-headed output for whatever reason, we must undo the damage we do. But before recognizing what happened, a team can do much more damage than an individual can. When there are interpersonal problems in teams, everyone's productivity can be degraded. And the conflict might be unrelated to the work at hand. It can be a residual effect of a previous effort, or it can arise from something as unrelated to the work as unfounded rumors of changes in office assignments. The word team means different things to different people. For example, with respect to decision processes, some of us believe that team means that each person's opinion is of equal weight. Others are searching only for work to do, and will do that work without question. Teams must define their decision processes for corresponding classes of situations. If they don't, each member will assume that their preferred decision process is in force. That difference in expectations can lead to interpersonal conflict. See "Decisions, Decisions: I," Point Lookout for November 17, 2004, for a summary of common decision processes. Teamwork is inherently parallel. The working members of the team assume that the parts they're working on will fit with the parts other people are working on. If a problem develops, and one of the parts has to be revised, some of the work already completed might have to be done again. This possibility is much less likely when a single person does all the work, because that person is presumably aware of all that has been done or will be done. Coordination risk is highest when interpersonal communication is the least effective, or when uncertainty is greatest. good, but also its ability to do damageparallelism is the need to trust that teammates working on other elements are honoring their commitments. That is, we give our all to one portion of the work, trusting teammates to do the same with theirs. If trust is absent, and people become wary, they devote some of their efforts to protecting themselves from blame. That is what makes wariness so expensive. Within the team's task, deadlock occurs when some members of the team are waiting for the output of one or more of the rest of the team. The whole thing can lock up if a dependency loop develops. If a subtask is late because of unanticipated difficulty or lost workdays, the rest of the team can become stuck. Would you like to see your comments posted here? rbrenJIOXtkMQSBpcSaNRner@ChacSjTzyskLUpetmDCVoCanyon.comSend me your comments by email, or by Web form. I offer email and telephone coaching at both corporate and individual rates. Contact Rick for details at rbrenuoiYraPFHGlrvyQVner@ChacxpweoFBsezEtKWTIoCanyon.com or (650) 787-6475, or toll-free in the continental US at (866) 378-5470.